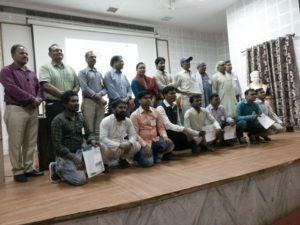 The two-day conclave of micro-entrepreneurs was a refreshing and much-needed event for 150 Navodyamis at Varanasi, which held on April 26th and 27th. At the “Navodyami Summit” the mentors Nitesh Dhawan, Assistant Commissioner, Handloom Department, Varanasi; Karuna Rai, Assistant Commissioner DIC, Varanasi; Mustkeem Ansari, Handloom Entrepreneur from Varanasi; and successful artisans Badri Prasad Prajapati, Shivpujan Jaiswal, Rakesh Arya took different sessions in their respective field including business development, marketing, communicating with customers, maintenance of accounts, brand building etc. At the second day of the Summit, that is on 27th five Navodyamis bagged the “Best Navodaymi Award” which includes a cash prize of Rs. 50,000 and a certificate. And the proud five Navodyamis are – Rajesh Yadav, who creates stone crafts, Ajay Singh, Chess Board maker, Vishal Vishwakarma, Wooden Handicraftsman, Kushal Kumar, Stonecraft maker and last but not the least was Ramji Maurya, who makes designer bags. ‘Navodyami Summit’ held at Varanasi. 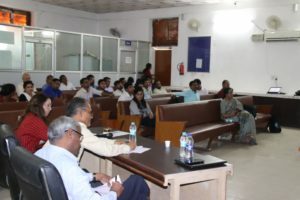 Sandbox Samvidha held an event on April 27th, 2018 at Ek Soch Sandbox, MCIIE, IIT-BHU, Varanasi. Entrepreneurs from 12 organizations of six different states of India, namely Utter Pradesh, Madhya Pradesh, Rajasthan, Delhi, Gujarat and Bihar took part in the event. Mrs Alyssa Newlon, Co-founder Milaan; Mr.G. Hariharan, Head for Corporate Relations and Sustainability and Mr Anil Verma, Founder PRAN were on the jury panel. The organizations pitched their ideas for better and sustainable solution in the sectors like Education, Health, Livelihood and Technology. Naveen Jha, CEO, Deshpande Foundation. The guests answered several questions asked by the participants and interacted with them regarding the goals and philosophy followed by the Ek Soch Sandbox. They also explained how Sandbox can contribute in nurturing young social enterprises. 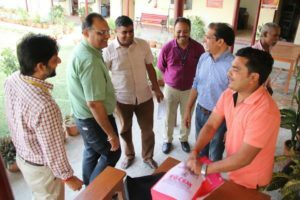 The founding team of Ek Soch Sandbox also visited Nand Ghar, a rural creative School for Children, Nageypur Village to understand the schemes adopted by the model village. The team inaugurated ‘LEAD Adda’ – a platform for Leaders to discuss the problems and come up with an innovative solution for the problems. visited Nageypur, a model village. Up Next:The fifth edition of Talaash was successfully completed recently at KLE Institute of Technology, Hubballi.